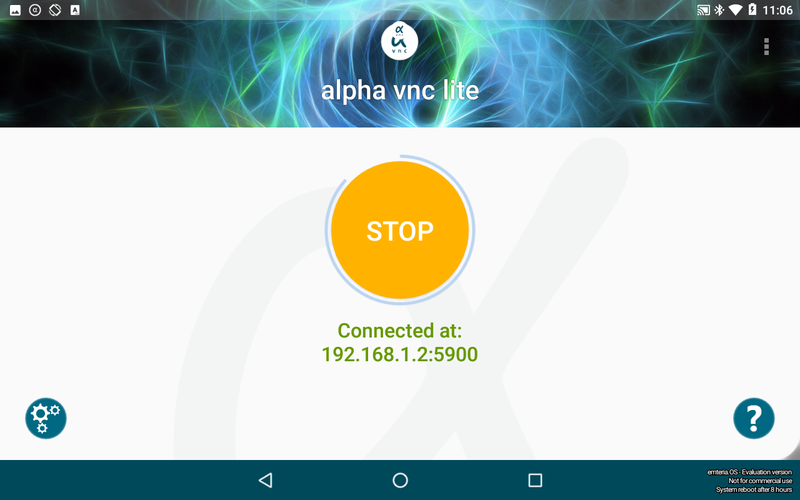 I know that vnc doesn't work since RTAndroid, however, yesterday i came across the app in screenshot and wanted to give it a go. The app is connected just fine till i start a vnc session from my pc then it crashes with the following error. "Unfortunately the pixel format of your device is not supported. We are working on this." Is there any way to solve that issue? the current emteria.OS defaults to BGRA8888 (as does Android-x86) for compatibility with the Mesa graphics driver. We've recently moved our development version to RGBA8888 (the AOSP default) and it might fix this issue. I will try the app and report back. That seems to be good news, i hope it will work. Just a quick update: moving to RGBA8888 fixed the issue in the VNC app. It also helps rendering in other apps (e.g. the map display in Waze). I think there will be a new release soonish. I think that will solve the screen cast/mirror issues as well. The reason for mentioning that particular app in the thread is it tells you why it doesn't work, that was a hint in order to solve the problem. Edit: well, it probably tells you why it doesn't work but i was not able to read the error because of the GPU driver issue. 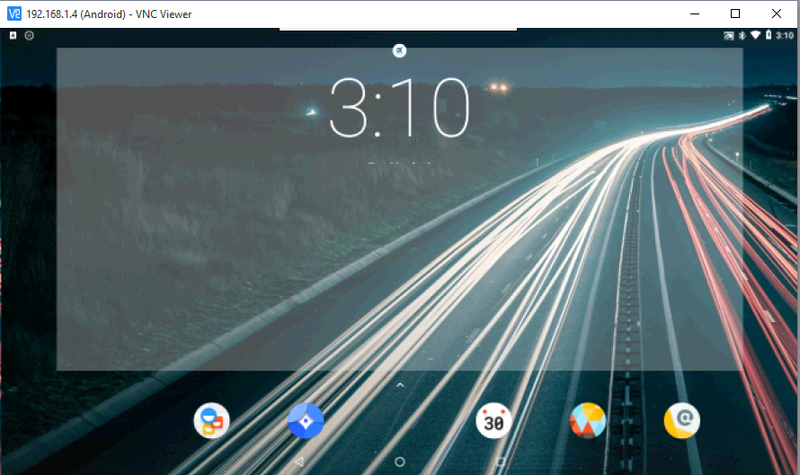 Hi, VNC is now working using Android Oreo, i believe Cast is working as well. Are you guys going to release an Android Oreo version soon? Thanks for updating. It would be awesome, if switching to Oreo would solve all the problems even with GPU driver problems. But I cannot believe that... it is more probable that your version is using another way of rendering (maybe software?). We would like to fix the underlying problem instead of providing workarounds, but we don't have a solution yet. If I am wrong and Oreo fixes it while preserving good performance, we will definitely look into it. Regarding GPU renderer, does this screenshot make any sense to you? Anyone successfully gets VNC Server running yet? There is an issue with postimage website. We have a new approach for making this work. I hope we will know more in a couple of weeks. @roxette, which application did you use (images are broken)? do you know which version that was? Thanks for your fast reply. This app acts as a server, right? Or only as a client? I'll take a look at it tomorrow. The app is VNC server only. That Oreo screenshot was captured from my windows 10 pc using VNC Viewer to prove that it works. However i believe you tweaked that vnc server to support Emteria pixel format only therefore other apps pixel format problem remains unsolved. Including Cast feature not working and could be the same issue for barcode scanner and Whatsapp videocall too. Does the integrated VNC server used in Emteria support bidirectional shared clipboard? Edit: it seems that it doesn't as i'm able to paste text using Real VNC viewer on my pc to Raspbian Stretch VNC server and vise versa. File transfer and chat is supported as well. Is it possible to solve that issue? Those are great ideas. I've added them to our TODO list, but I can't provide any ETA for now. Thanks for the quick reply Igor, i'll keep an eye on the release notes hoping that it will be sorted out soon. I just installed alpha vnc lite v1.5.0, i noticed that it supports shared clipboard. You just need to take care of the pixel format issue. Thanks for reporting! Does it support file transfer too? What pixel format issue do you mean? 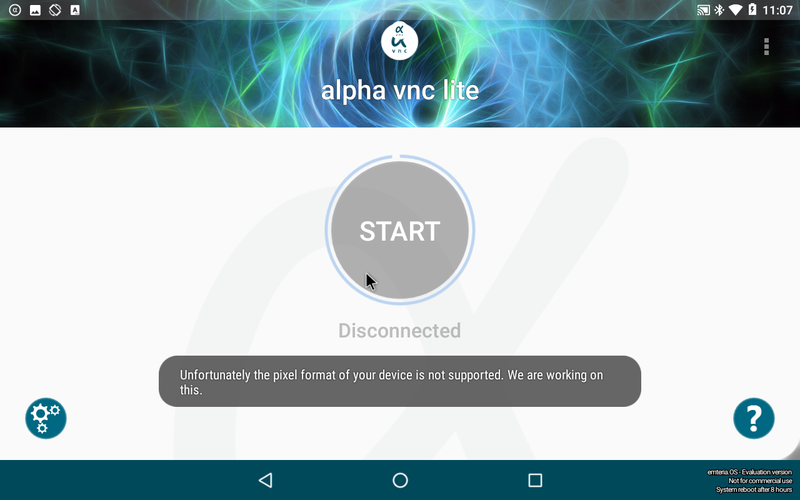 I meant the below pixel format error which was related to alpha vnc lite v1.2.6. No, file transfer and chat are not supported. Igor, if moving to RGBA8888 fixed the issue in the VNC app as stated by schake then why that pixel format error still exists? That error was fixed a long time ago - given that you are not using the official touchscreen in FKMS mode. Booting emteria.OS 0.6+ with a normal HDMI output should automatically switch to RGBA8888 after the initial reboot. My bad, i'm using Emteria v0.5.21 since my younger brother messed up my Ubuntu drive and i need to reinstall Ubuntu from scratch. I was expecting that moving to RGBA8888 will also solve Cast and Barcode scanner issues ... too bad it wasn't fixed. I can't test Barcode scanner since i don't have a cam module .